The Artists of Stonehenge and Easter Islands or garden planners? 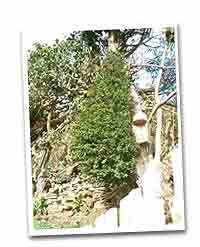 If the caretakers of the HoBB Gardens are careful with this Yew for the next 4000 years, you will probably need to walk through its trunk to use the top terrace! I visited the wonderful Yew trees at Hope Bagot Church recently and stood inside one of them, wondering what the gardener would say that had planted them so many thousands of years before. With this thought came the view that my own actions could, or rather will have an effect on things way beyond my lifetime. An oak tree planted now could ‘see’ the reality of space travel that only our present science writers imagine. If I constructed a vast circle of stones around a box of ball-point pens goodness knows what the science-past writers would say of it in 5628 A.D. If you get the chance to do something great, do it. If you don’t, then make the chance. The greater it is the more you will confuse future historians, especially if you throw away the instructions on how you put it together and why you did it! From Stonehenge to the Easter Islands, it was, in my opinion, “Artists at Work” doing some fun stuff that they thought would be great. It was also the designer at work, making sure of the more practical issues. And according to some, it was the accountant at work, telling the artist and designer how much stonework and labour they were allowed to afford. When planning your ‘great’ something, you will need a team – if it’s GREAT, count me in! 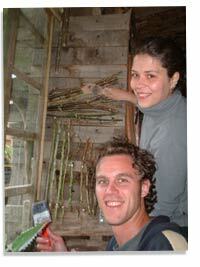 Friends, and members of ‘wwoof’, regularly visit the HoBB. Some chill and relax whilst others enjoy a creative break and a taste of whatever’s going on at the time. It is fun to try out something new and we are regularly involved in inspiring activities.